Florida is a popular destination for Ontarians and others around the world, but they may be missing out on some of the fabulous family activities available in the Sunshine State. Here are ten family friendly activities you can find throughout Florida. Disney World. This is likely the most popular family activity in Florida and there’s good reason for it! Perfect for all ages, Disney has something for everyone including rides, shows, characters, education, animals and great food! With four parks to visit (Magic Kingdom, Hollywood Studios, Epcot and Animal Kingdom) I recommend a visit of at least 4 days to get the most out of your Disney World vacation. If you wish to enjoy some water play at one of the two water parks, you may want to book a minimum of five days. Universal Studios Orlando. Home of the Wizarding World of Harry Potter, this exciting destination is ideal for families who loves rides. The two parks include Universal Studios Florida and Islands of Adventure and while there are some attractions for young children, they are really ideal for tweens and older. If you are visiting with children, plan for at least two days at the parks. Make time to enjoy CityWalk too! Legoland Florida makes for a great day trip with the kids. Unless they are really into Lego, the teenagers may not be overly excited about Legoland, but it’s a huge hit with young children right up to tweens. They have a great variety of activities, including a water park, that will keep you having fun all day long. The Kennedy Space Center. Head over to Cape Canaveral to learn about the space program and even have lunch with an astronaut. This is not only a fun way to spend a day, but also a great educational visit. Visit on a launch day and you can get the experience of a lifetime! Dinner Shows. If you are looking for a fun activity for just a part day, try a dinner show! In the Orlando and Kissimmee areas you can find Medieval Times, Pirates Dinner Adventure, Capone’s, Sleuth’s and Arabian Nights. Meet Winter the Dolphin. Fans of A Dolphin Tale will be excited to visit the Clearwater Marine Aquarium where they can meet the real Winter! You can also meet Hope, Winter’s new aquarium friend and other Marine life. Adventures Unlimited is the ideal vacation spot for families who love the outdoors. It is located in Northwest Florida and is full of outdoor adventures like camping, canoeing, ziplining, kayaking and tubing. 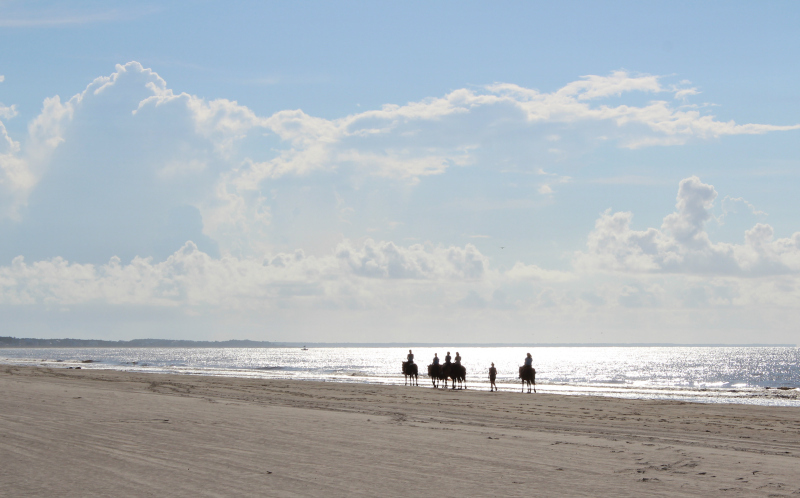 Nature lovers will also be excited to visit Gulf County Florida where they can ride horses on the beach and view all kinds of wildlife including birds, dolphins and even see turtle nests and possibly some hatchlings! You can even volunteer to check the turtle nests in the area. History buffs will enjoy Titanic: The Artifact Exhibit found in Orlando. It is the home to many Titanic artifacts and there is an abundance of information about the doomed ship. The water! Florida’s coastlines offer a host of activities including parasailing, snorkeling, swimming, surfing, fishing, boating and more. You can search for manatees, bald eagles, pelicans and many more incredible animals in the area. Oh wow! I would definitely like to visit the Titanic Artifact Exhibit! Wow! Didn’t know about the Titanic Artifact Exhibit! I love your list…it’s great for those that are heading to Florida for a WDW or heading on a cruise and need stuff to do while they have time. This is almost a “bucket list” for a senior like myself. I live alone in frozen Alberta and can just envy your experiences. I have never been to Florida, but I sure would love to one day. Great list. I love Florida! There is so much to see and do! We haven’t been for 13 years so we really need to make a trip there soon! Great list of activities to see and do.. I would love to visit the Titanic: The Artifact Exhibit . I know that my family would enjoy any of the activities on your list. Universal Studios Orlando. Home of the Wizarding World of Harry Potter is my #1 dream destination of all time!!!! I need to be there someday!! Some great activites thank you! We’ve been talking about heading to Florida next winter for a few weeks and bring my mom in law.